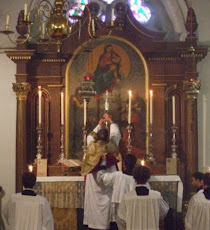 The traditional Rite of our Latin Church, contained in the Tridentine Pontificale, for Blessing a Lady Abbess is, not surprisingly, very closely similar to the Consecration of a Bishop or the Ordination of a Presbyter or Deacon.. The Abbess prostrates herself as the Litanies are sung over her; a consecratory 'Preface' is chanted over her; the Bishop lays his hands upon her head and then for the rest of the Prayer holds them extended before his chest; for a porrectio instrumentorum she receives the Rule; if she has not previously been formally veiled, she now receives the veil. Such a rite speaks for itself. But the words of the prayers are, if anything, even more expressive in what they tell us about the Order of Abbess. The precedent for the Blessing is seen as the appointment by Moses of Leaders set over the People of God (ad gubernandas Ecclesias praepositos), just as the Consecration of a Bishop is described in terms of the Aaronic high priesthood. The Gospel given in the Common of a Confessor Bishop is cited ("Well done, good and faithful servant ..." ). The Abbess, according to the Bishop's prayer, "talis in hoc ministerio perseveret, qualis levita electus ab Apostolis sanctus Stephanus meruit perdurare". She is blessed "ad gubernandam regendamque Ecclesiam tuam fideliter ut speculatrix ...", recalling the traditional image of the Bishop as the Watchman of his Church. The Episcopate, of course, is part of the divinely instituted Sacrament of Holy Order. The state of Abbess does not possess that quality. But the Blessing of an Abbess is, surely, the very highest form of a Sacramental that the Church knows. Perhaps all that is something the Church badly needs now: strongly orthodox and liturgically literate women taking a hand in the raising of clergy. Readers who know me and my background are hardly likely to suspect me of going 'soft' about absurdities such as Episcopussies (that childish old joke is not mine). The contrary is true. I think calls for the 'ordination of women' are symptoms of disorders arising from a failure to understand the place naturally occupied by women in a sound and traditional and relaxed Catholic society. So let us pray for the Sisters and especially for Mother Cecilia, that the Holy Ghost may be powerfully with her in her munus praedicandi. May she use her crosier to swipe mightily at any passing dissidents. ... one of which was this: a certain Reverend Mother in the Order had too much influence among the friars!! You couldn't make that up, could you? Scratch a feminist/liberal/modernist and ... ten to one ... you'll find ... a woman-hater. I read somewhere, but can't remember where, an article whose author opined that Hild of Whitby must have been a bishop to have had such influence over the Church. I suspect that part of this arch-clericalism may have come from the similarities to episcopal consecration in the rite of blessing of an abbess as well as a failure to appreciate the role of women. Yup. Look at Mother Angelica. She developed and ran a media empire without any title beyond "mother superior," and one could argue that she had more control over the men than over the ladies of her convents. Formal titles are unnecessary to the traditional sort of female ruler and governor. Their position is whatever they make it, they cannot be thrown out in elections, and they do not have to work at City Hall.